The best possible darkride/rollercoaster in the world. This is such an awesome ride, that I hopped back into line after I got out. ok let me explain to you my adventure to Universal Stuidos & Islands of Adventure. the last time i went was when i was 11 and i went on like one ride continously. this time, i was turning 15 and i decided to bring my IOA-obsessed friend and she forced me to go on every single ride except the hulk and dueling dragons (im too scared). 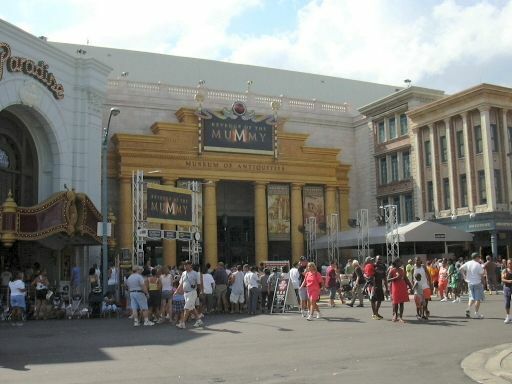 the first ride i went on was the mummy. right when we got to the loading docks, i had a huge PANIC ATTACK. i mean it was terrible. i was crying and screaming on the floor while my friend dragged me while i tried to run away and this lady was like "she cant get on the ride like this. you cant drag her on". i told my mom and my friend to go ahead but then everyone in the coaster car starting cheering so i ran on quickly. i screamed when the animatronics came out. i closed my eyes for the rest of the ride as i buried my head into my friends shoulder. after the ride i was like "omg i want to go again. but i need a few min" and then i went on a couple more times. even thought its like a 3 or 4 min ride, it seriously felt like 1 min. if youre like me (i doubt it) and you want to research the mummy before you go on it for ur first time, stop now. youll be fine. its not that bad. and this is coming from me, a huge scaredy cat. have fun! This ride is the best ride in Uinversal Orlando. With the special effects that test all your physical sensations, it really creepy a lot pople out to some extent. In the past those sensory effects are usually used in 3D shows, but why not in a coaster? Altough I would say this ride is rather evoultionary than revoultionary in terms of technological achievement, it is still the top notch entertaining attraction that Universal at its best. For people want to know what to expect, I would say it is a combination of Indiana Jones ride + Space Mountain. The final twist is very very funny although it took me twice time of ridding to figure out what it is. (I mean the fake ending) If you are the fan of Mummy series, this ride should be your baby. The special effects are great especially the heat and the scarabs, but the ride itself is not all that inspiring. How come I didnt know this was a Premier LIM uphill Launch? People need to tell you these things. this is awesome...better than i exspected...the detail in the ride is amazing...when you go into the giant room and the "sand head" is talking to you (the huge TV screen)...it is amazing...the launch and roller coaster part is awesome too!...combined with the backwards motion to escape the scarabs (bugs)...this is a MUST RIDE! it is worth the wait...! F*ckin awesome roller coaster. The fire, the speed, the g-forces, the high speed turns and how it finishes at the end. What a blast!!! Mummy is a very fast roller coaster ride. Itsn the fastest coaster that I ever been on. On the Mummy they do take your picture. And the special effects are awesome. I like the fog effect on the ride. Ill rate Mummy a 10+. Its a must ride coaster for all coaster nuts. Universal Studio and Isalan Of Adventure they sure know how to theme thier rides. Better than Six Flags America. The 1st row is the best because you get sprayed with water on some parts of the ride. And the Mummy coaster is a very quick coaster. My girl friend and I rode it about 22 times. I have to rate this coaster a 10 because it is this coaster that has gotten me back into the spirit of coasters. The first time I rode The Mummy it scared the crap out of me... being in the dark and not knowing what was coming next absolutely terrified me. Determined to overcome my fear, I rode it again and again and again. I now giggle and laugh everytime I ride. Its just super fun! The effects are awesome and really make the coaster what it is. Do not miss this ride!